Fuse #8 was very enthusiastic about this, and I did think it had an elusive charm. Unfortunately, it eluded me. 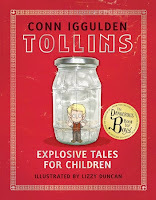 I could see how they started out as stories told to a child at bedtime and they would be great read-alouds. They're sweet and simple and delicately charming. I'm just doubtful about what age would be interested in reading them on their own. They're about the right length for a beginning chapter book, but too slow-moving and whimsical to appeal to most children in that reading range. 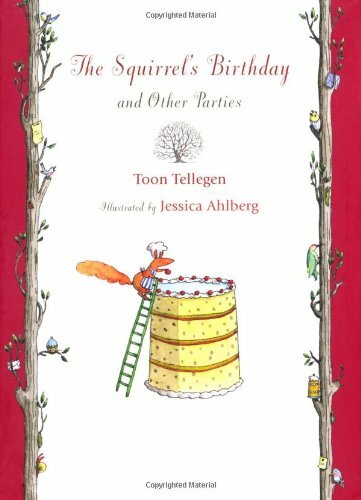 I think if I was going to get just one "cute and sweet" book it would probably be Tumtum and Nutmeg by Emily Bearn, which has a bit more plot and substance. There's no plot to this thick little picturebook, just a series of increasingly hilarious transformations as the reader gets to consider just how much fun an extraordinary pet could be. Each page shows an owner on the left, appropriately dressed, with a conventional pet on a leash on the right. When you lift the full page flap on the right page, it reveals an extraordinary pet attached to the owner's leash. Small details like the matching of the pets to their owner's clothing and behavior and the simple comparisons in the text add an inner chuckle to this fun story. Verdict: Kids who love animals, pets, and surprises will giggle with delight over this vibrant collection of silly art. This deceptively simple story of nocturnal woes is full of sly humor and animal fun. 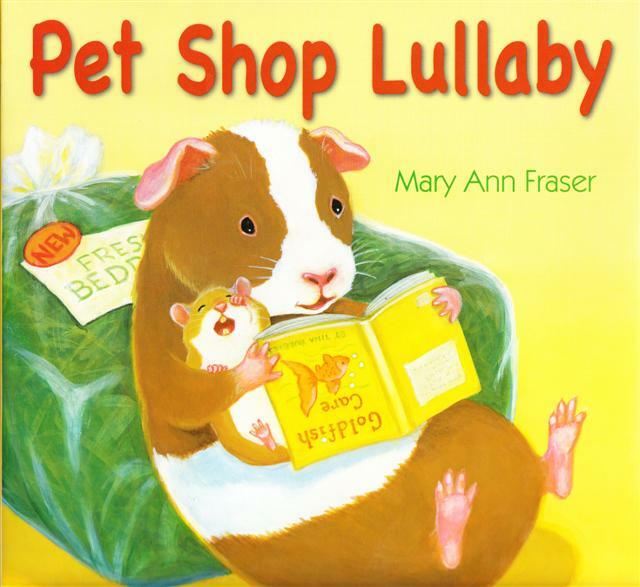 A little hamster can't sleep at night...which means the other animals in the pet shop can't sleep either! One by one, they try to get him to sleep until they finally succeed....or do they? Pair this with The Baby Beebee Bird for a silly bedtime story or a lesson on nocturnal vs. diurnal animals. Plus, it's got a guinea pig! And that first spread of the little hamster is soooo funny! The only positive thing that came out of my first and last trip to Waukesha, apart from an abiding resolve to never set foot or wheel within that city's vicinity again, was the discovery that there are Geronimo Stilton comics in existence. 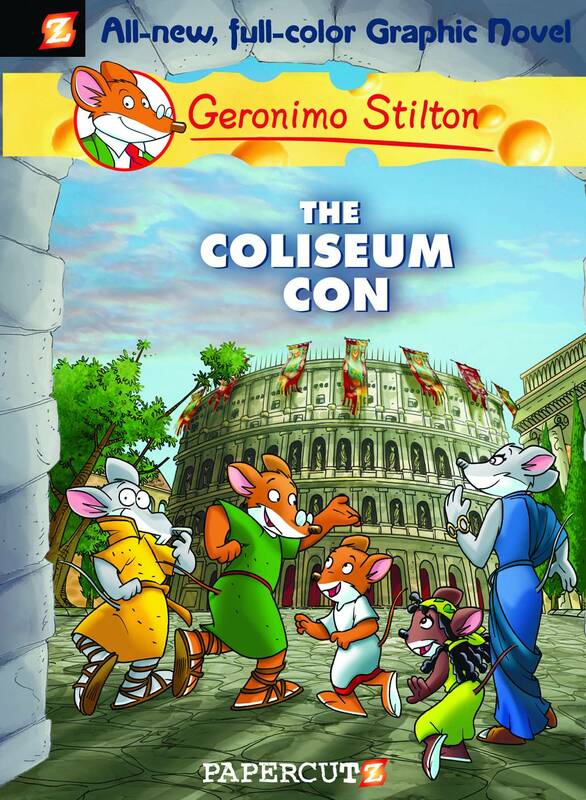 I am not a particular fan (or un-fan) of Geronimo Stilton, they're just the kind of books that sit firmly in the background of the series shelf, on the bottom no less, and trot briskly and efficiently in and out of the library. Hmm, comics says I, let us borrow one from another library and see what they're like. Well, they're a lot like the books really. Lots of color and action and humor. The vocabulary is about the same level, but the graphic novels are heavier on illustration than text and the print is much smaller than the books. Verdict: You could either recommend these to younger kids who can follow more of the story in the pictures and pick up gradually on the text, or to older readers who won't have a problem with the vocabulary and smaller print. Either way, we're getting all of them for the summer! I keep a notebook of lexiles of our new books because the schools here are deeply entrenched in Scholastic's Reading Counts program. I make the list by lexile number and then alphabetically by author. This creates hilarious "lexile friends" which I was noticing as I printed out the updated lists today. Pam Bachorz' Candor and Judy Blume's Friend or Fiend with the Pain and the Great One. Note that Judy Blume is 360 - a whole 10 points higher than Candor! Dashka Slater's The Sea Serpent, a charming picturebook about friendship and letting go, sits cozily side by side with Cynthia Leititch Smith's Eternal, a seething paranormal romance with vampires and angels. Eternal is 690, a whole 30 points higher than Sea Serpent! and my favorite of all pairings...Pamela Duncan Edwards' alliterative picturebook, Princess Pigtoria and the Pea, sits cozily beside Amy Efaw's hard-hitting teen novel, After. Pigtoria, by the way, is 70 points higher than After. I couldn't make it through this one. Too patronizing, twee, and the writing was flat and stilted. It doesn't help that I dislike the commenting narrator style, as per Series of Unfortunate Events. The story was trying very hard to be quirky and just came over strained. Ick. Chester Fest Part 2: Now that we are all agreed on the fabulosity of Chester, how can we fully experience his genius? Here we are with our big star, Chester. We have laughed at all his books, we are amazed by his genius. But who do we share him with? How do we, gasp, make him educational? Can we make Chester crafts? Well, you can forget the educational part, because, hey, I'm not a teacher. Mostly because I don't like making books educational. You can see "curriculum connections" (plus lots of other cool ideas) on the Kids Can Press website. I have items of less educational value, at least on the surface, to share. First, who should read Chester? Duh, everybody. Oh, you meant appropriate ages. Well, in my opinion, the ideal age for Chester is K-3rd grade. This is the age group that is starting to become comfortable with the idea of narrative and they have a sense of humor, both very important for Chester. It really makes a difference if your audience can read, at least a little, so they can see which parts of the story Chester is writing. But do not limit yourself! No! 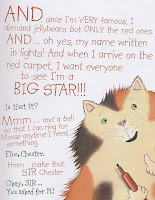 Chester is great fun to read with toddlers and play find-the-big-fat-cat and the little-tiny-mousie and for learning to recognize the color RED. It's hilarious! Try it sometime! Preschoolers, well, not all of them will get the humor. They just don't understand sarcasm at that age. Plus, as I said before, it really helps if your audience can see which parts are Chester...however, this can easily be dealt with by using your storytelling powers! Melanie has an exasperated, don't-make-me-come-over-there-furball voice. Chester has a cross between whiny and I'm-being-very-silly voices and can sometimes be Very Loud, thus prompting your circulation staff to wonder what the heck you are Doing In There. Kindergarteners through 3rd grade will just laugh themselves sick. But we are not stopping there! Oh no! Guess what books I took with me to demonstrate reading aloud techniques to a high school child development class? Yep. Chester. They completely cracked up! But we can't just read stories! We have to do crafts and activities and, you know, stuff! Fortunately for us, Chester is just begging to do stuff! For younger kids, some lined paper and lots of red markers and you are set! Draw your own Chester! Make your own red scribbles! I have a fun writing project in mind for Chester that I want to try with my tweens next fall...we are going to read the Chester books, laugh uproariously, and then I'm going to give them each a basic "story" and they get to bring out their red markers and create a "Chesterized" story. I think it will work. If you have a group you've worked for a while with and they're comfortable with each other, they could do this as a team - one person write the basic story, the other person be Chester. The third Chester book, Chester's Masterpiece, is even more than the others about the art of writing. You can really make this one educational. Of course, you can also make kids, you know, hate it too. Whatever. But it's a fun way to brainstorm writing ideas - maybe for a writing club? Definitely more fun for a writing class than a textbook on writing techniques! How do you use Chester at your library? Share your ideas! Spread the glory of Chester! I'm a bit wary of picture book biographies. I know, everybody swoons about their gorgeous illustration and their obscure subjects, or new treatment of famous subjects and unique presentation and....I just don't see them circulating much at our library. The only biographies kids read for school usually have to be 100 pages long and most picturebook biographies are too long for casual read-alouds. Historical figures are even more of a problem to get out there. But I think this one won't have a problem. Nope. 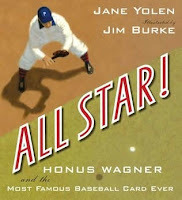 First, we have Jim Burke's illustrations which are an alluring combination of historical and vivid action, calculated to grab any baseball-minded reader without them immediately thinking "oh, it's some old book." Second, we have Jane Yolen. Her lovely language and excellent turns of phrase are evident here, but her language is carved down to its strong fundamentals and strongly bulwarked with the facts and stats that sports fans love. Parents will be pleased to see a "celebrity," even one long dead, who's a real role model, unlike many sports figures today. Kids will just be fascinated by Honus Wagner's impressive records and triumph over poverty, illness, and his own shortcomings. Verdict: I'm looking forward to handing this one to sports fans - I think it's going to be a success! I first saw The Brain at summer 2009 ALA. We were on our way out, and I scooped it up and added it to my pile. Then, somehow, it moved to the bottom of the pile. I kept meaning to read it and I didn't and...pretty soon, I found myself on the way to ALA Midwinter. With nothing in my bag but The Brain Finds a Leg and Lost Conspiracy (which I never did read completely). I started reading The Brain. I started giggling. By the time I had arrived in Boston, I had finished the book, laughed myself silly, and was getting very wary looks from the other passengers! Martin Chatterton is Carl Hiassen on a double dose of weird crossed with Roald Dahl. That pretty much covers these books. In the first story, we start out with a kind of weird introduction, which I had a little trouble getting through - a pod of whales goes crazy and kills a boat of whale watchers. However, the real story starts afterwards, with the whale watcher boat captain's family. His average son Sheldon is getting bullied in school and slogging through life in a haze of misery, his dumb surfer son Sean, who is their mother's favorite, is being nasty to everyone, and their mother is helpless and miserable. Then Sheldon meets The Brain. He's the combination of every famous detective who ever lived and exerts a strange influence over Sheldon's impossibly nasty teacher. The Brain informs Sheldon that he is suitable for a sidekick, something The Brain finds himself in need of. Together, they investigate the strange occurences from the suddenly aggressive whales to missing bodies, not-so-missing body parts, canine reptiles, and light-fingered koalas. The ending is a little abrupt, but matches the zany flavor of the story! In the next tale of Sheldon and The Brain, the two are now brothers, living in Switzerland. By the way, the first story takes place in Australia and I thought it was Florida for quite a while, until the koalas showed up really. It didn't occur to me that people don't surf in Florida. At least, I don't think they do. Anyhow. More strange things are afoot, including missing parents, a gorgeous girl, and rabid cuckoo clocks. I didn't like this one quite as much as the first, although it was quite funny, but I'm just not much of a sequels person. It did move more smoothly and didn't have the problems with beginning and ending that the first one did. I worked for many years with groups of toddlers. Then, I didn't. I worked with preschoolers, older kids, and college students (preschoolers and tweens are the most fun). At my library, I do programs for kids age 3 to 12, with an occasional teen program thrown in. However, I substitute for our marvelous Miss Pattie and...I seem to have lost the knack for working with toddlers. Partly, of course, the problem is the kids don't know me and it's a big group - 30 or more kids and parents. (I never had the knack for babies. I generally try to bribe another librarian to cover those). I think I was also being too slapdash, just grabbing stuff from my preschool storytime. So, I created a backup toddler storytime and tested it today. We started out singing the storytime song I always use to open, then we read Don't Let the Pigeon Drive the Bus with lots of "no" thrown in. 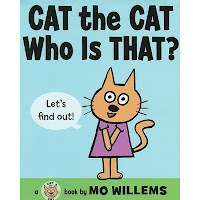 Then, having just snagged it out of the box, I read Mo Willems' newest book, Cat the Cat, Who is That? the kids loved it insanely, shrieking out the different animals and exploding with laughter when we named them "Fish the Fish," "Duck the duck" etc. Then we all stood up and sang "Down on Grandpa's Farm" Then we read Jan Thomas' What Will Fat Cat Sit On? and Can YOU Make a Scary Face? both of which I just ordered second copies of for my professional collection and which are my favorite interactive stories EVER. We finished up with animal puppets - all you need is die cut animal shapes, popsicle sticks, tape, crayons, and markers. This is a marvelously gothic gem of a book. I bought it a couple years ago, I think the title and description appealed to me, and tossed it on the shelf and that was it. Until I saw a very enticing blog review of it (sorry, I forgot where. I tend to forget things like that) and decided to read it for myself. It was deliciously creepy, delightfully wicked, and tartly sweet. We begin with the Lady Lamorna, a wicked sorceress, who has decided she needs a new dress - and not just any new dress, a marvelous new dress decorated with skulls. Unfortunately, even a powerful sorceress needs money when she's going to buy a marvelous velvet dress with skulls from the Ancient Crones. Enter a wicked plan, complete with princes and frogs, an abused but courageous Trueheart, and a very wicked stepsister indeed. Every sentence of this story is perfectly crafted and perfectly positioned to create an amusingly creepy story with a satisfying ending and memorable characters. and then there just had to be a sequel. *mutter* remember what I said earlier about my desire to whap people over the heads with their sequels? Well, this one falls into whapping category. There's no growth in the main characters, just additions of quirky but unmemorable characters to the cast. There's a different plot, but the ending is too pat and the main characters from Robe feel like they're there for the series, not to perform any specific role. 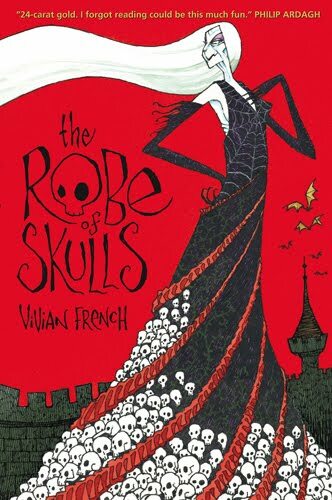 It feels as though the author tried to recreate the magic of Robe of Skulls, but it just didn't work. and now I'm grumpy. Whap! Verdict: I will happily recommend Robe to all and sundry, but I don't plan to continue the series. First of all, I must explain my degrees of author interest. In general, all I require from an author as far as personalities go is that they have a findable name. Now, I don't mean spellable - nobody can spell OR pronounce Scieszka (except a small and select number of librarians) but he's very findable. "That guy with the funny name who writes funny books" and "Jon s-something" are easily findable. On the other hand, that new author, Olga something? I think it starts with a P and it's extremely long and full of consonants? Yeah, even I can't remember it. So, in general, that's all I require from authors. Of course, there are those authors whom I think of as....you know, Real People. The kind of people if I met them we might go out for Chinese and talk books. Mostly people whose blogs I read and they feel, well, comfy. Like Kate Coombs and Laurel Snyder and the author who I feel sort of belongs to me, Jean Little or maybe I belong to her. Melanie Watt is writing a story. A perfectly good, if a little banal, story about a small mouse. A mouse? Who wants to hear about mice when there are amazing, charming cats! To be specific, one cat. Armed with a large red marker. Chester and Melanie spar back and forth, using a combination of art and dialogue to tell a story about a story within a story, until the final hilarious ending, when Chester gets his comeuppance and exits vowing revenge. Remember that whole revenge thing? Well, Melanie has compromised and is offering Chester a starring role in her next story. 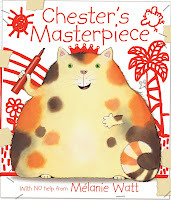 But Chester, being the ultimate diva, isn't satisfied and once more decides to take over, forcing Melanie to search for more amenable talent and resulting in an even funnier showdown between the harrassed author and self-proclaimed genius cat. Yes, I did said genius. Writing a story should be easy for a genius, shouldn't it? 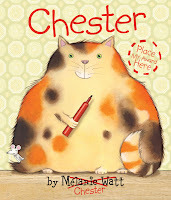 Melanie Watt, mysteriously bereft of her writing and illustrating materials, is forced to communicate with the sneaky Chester through increasingly irate post-it notes as Chester attempts to create his own story and art from scratch. Unfortunately, even without a cat to interfere, it's not as simple as it looks. Chester's unconventional and ridiculously bad story slips neatly into the realm of so-bad-it's-excellent and keeps the reading in stitches the whole way through. Stay tuned for more Chester Fest, coming soon! 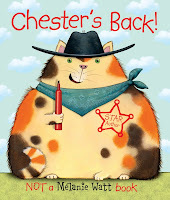 Chester, Chester's Back, and Chester's Masterpiece by Melanie Watt. I bought the first two, partly in order to claim for myself a marvelous Chester bag and the third was given me to review by Raab Associates. 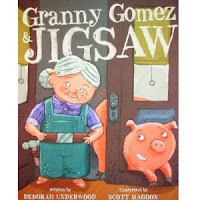 Plump, exuberant Granny Gomez is lonely, despite her many interests and collections. She's delighted when her young friend William brings her a pet....but it's a pig! Granny soon comes to love Jigsaw and they spend many happy days together. But when Jigsaw gets too big for the house, what will happen next? Detailed, strong illustrations and rounded intriguing characters will hold preschool and kindergarten children's interest from the first page to the last of this fun story. It may even encourage them to try out a few new interests of their own! Perfect for storytimes about pigs, building, or just for fun. This felt like a very traditional fairy tale, and the subtitle says it's Italian, but the book does not include information on where it came from or how far it has been adapted. The "moral" at the end wasn't part of the original tale, I'd guess, since most traditional folktales certainly don't have the woman rejecting a wealthy suitor - however unpleasant he may be - and learning magic. But I could be wrong. The illustrations are historically appropriate for the apparent time period, but won't appeal to most of my patrons who like fairy tales with "pretty" pictures. This original fairy tale contains many familiar themes and gorgeous art, but has limited appeal to children. A princess cannot get warm and the king offers a reward to anyone who can help. People offer blankets, clothes, various remedies, and nothing helps. 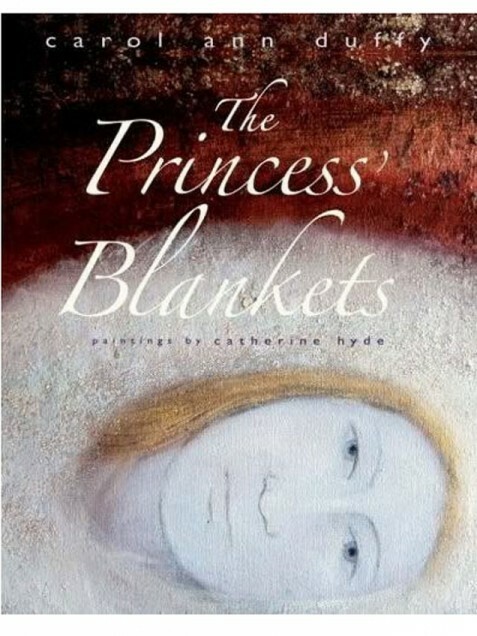 Then a mysterious and frightening man shows up and creates a series of blankets for the princess out of the ocean, forest, earth, and mountains. The princess is still not warm. Another man comes and offers her love and the world blankets return to their places, people rejoice, the princess is warm, and there's a happy ending. The writing is rich and atmospheric and the pictures are mysterious and complex with textured images running through the various blankets. However, the text is too long for younger children and the story too conceptual for most of them to grasp. 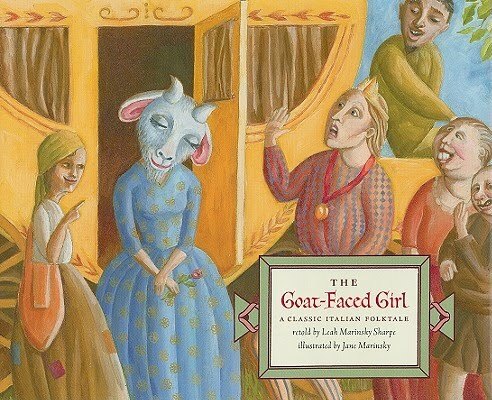 Older children who like art and fairy tales may enjoy this, but that's a limited audience. I'd say this book is best suited to be a gift to an adult who enjoys fairy tale art. Don't you just loooove that cover? I was delighted to discover, when I finally cracked it, that there's a delightful silhouette illustration on the inside! Verdict: This is a fresh and enjoyable fantasy with enough of the original fairy tale to steady the plot but plenty of characterization and new elements to hook the reader. I did feel that the dialogue was a bit stilted and the language overly romantic and heavy in spots, although the latter is just my personal preference. I added this to the library's collection last month and it's been quite popular, zipping on and off the new shelf. I recommend it if you have fans of light fantasy such as Kate Coombs, Jessica Day George, and Victoria Hanley. A little girl hysterically refuses any of "these clothes" and proceeds to tell the reader why in increasingly wacky rhymes. 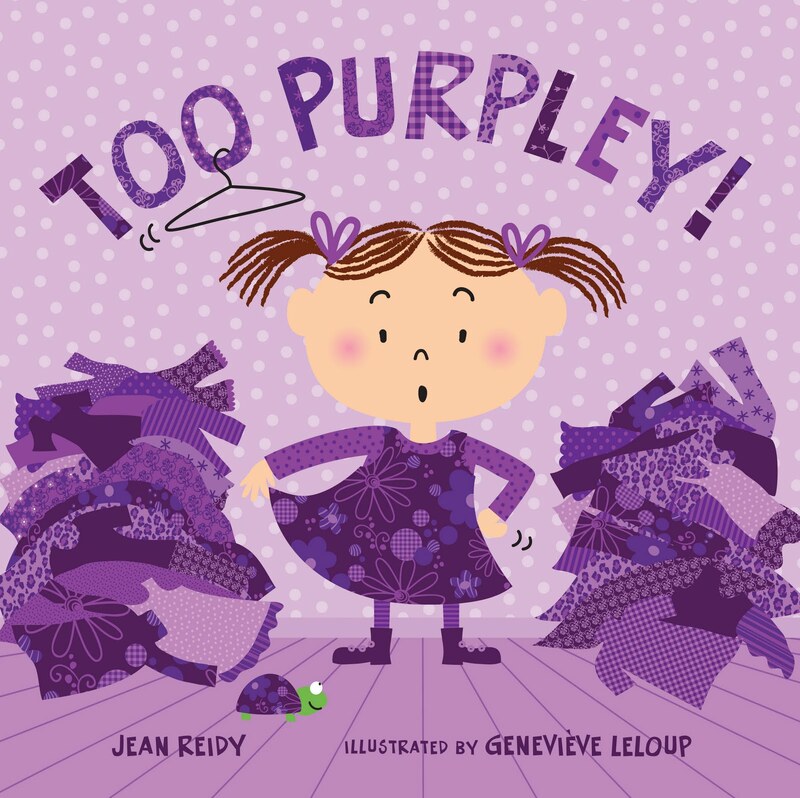 Starting with "too purpley" and "too prickly" and moving on to "too zippery" and "too polka-dotty", every outfit is displayed and rejected until she finds one that is "just right." Parents may groan at giving their offspring more vocabulary to increase their pickiness, but the engaging rhymes and wacky outfits make it clear it's all just in good fun. Verdict: This quick little read is perfect for toddlers and any budding fashion-lovers. For an issue book, this is pretty good. The pictures are pleasant and warm and there are some quite lovely scenes. The text is a little blah, but most issue books are so clunky and in your face that this is relatively extremely good. 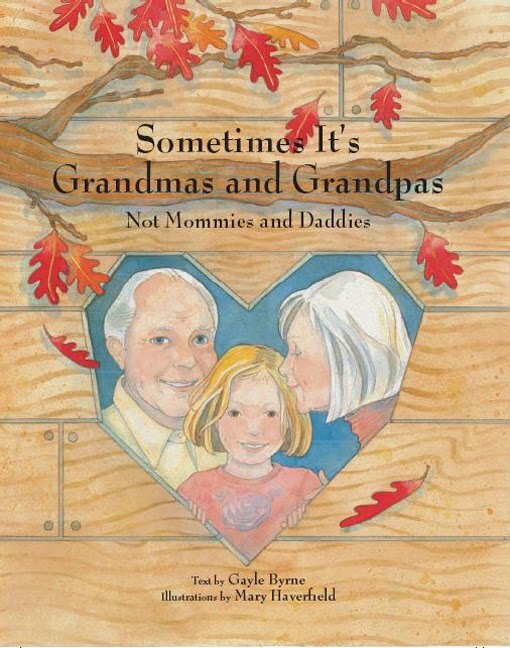 A little girl lists all the things she does with her grandparents, whom she lives with instead of her parents. 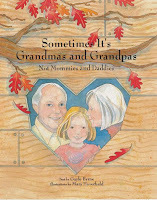 The focus of the story is on the warmth and affection shown her by her grandparents and shows how normal her life is. There's an author's note and further resources at the back of the book. I can't think of a single other current book on this subject and it's definitely a growing trend. Verdict: Pretty good and fills a gap. We'll probably get it in June for our Tough Topics collection. Abigail Iris knows exactly what she wants for her half-birthday; an adorable kitten from the adoption group at the farmer's market. When she gets her wish, everything seems to be working out perfectly....but then things go wrong. I haven't read the first Abigail Iris story (although it's now on my to read list!) but what set this story apart from the other little girl series is the strong realism of the story and sweet character of Abigail Iris. She's not a perfect little girl; she squabbles with her siblings and is whiny and selfish on occasion. Her family is realistic and warm; they have financial difficulties, arguments, and her parents' divorce isn't the picture-perfect glossy story I see so often in beginning chapter books. But Abigail is knows when she's being unreasonable and selfish and makes an effort to fix things that have gone wrong. Her family is warm and caring and works through their problems together. Verdict: Joy Allen's charming black and white illustrations bring to life this story about friendship, family, and growing up. 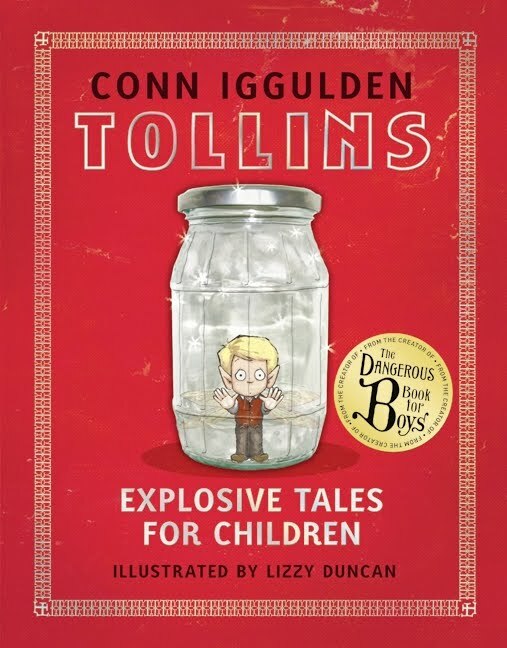 Hand this one to kids who are comfortable with chapter books (its length and vocabulary put it a little above a beginning chapter book) and to fans of Clementine and Kennemore's Alice. This one is selected from my stack of rather grimy old Scholastic mysteries, which I like to dip into on occasion. It's a typical Mary C. Jane story, containing plenty of mystery and a "character issue." In this case, Anne never seems to be able to make friends or be as popular as her outgoing older brother, Stevie. When their father inherits an old farmhouse, the children are first excited and then dismayed when they discover how the neighbors detested their deceased distant relative. Their dislike seems to have passed down onto Anne's family and her parents quickly plan to sell the house. But first, there are a series of mysteries to solve - a missing painting, mysterious howling, and the strange behavior of the girl next door. Verdict: Plenty of shivers up the spine, although nothing too scary for a younger reader, and a tidy conclusion to the narrative, with a brisk moral for Anne's social difficulties. 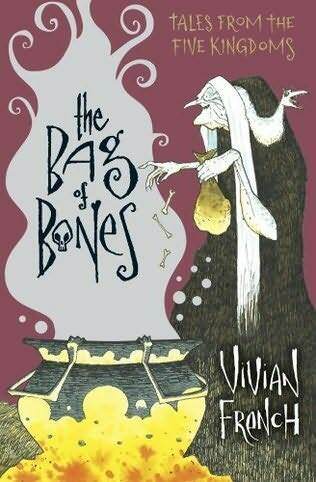 Not my favorite of the Scholastic mysteries, but a decent read. Public space. Who controls it? Where should it be located? Who should be allowed to use it? Do we need public space? These and more questions are answered in this thought-provoking book which includes history, architecture and design, politics, and sociology in a broad look at public space past, present, and future. The authors are very definite in their own opinions and presentation, but include questions and discussion of controversial aspects of public space as well as anecdotes and examples from around the world. There's also an opportunity to design your own public space and suggestions on ways to become involved and active in conserving and creating public spaces. The book is only 80 pages long, but packs plenty of information and discussion into those pages as well as punchy graphics and a layout that keeps the text from becoming too heavy. The language and approach indicate it's aimed at middle grade and younger teens, although older teens who are interested in activism may want to pick this up as well. It's primarily focused on urban spaces and a little on suburbs. Small, rural towns and libraries (such as my own) may find this interesting but not particularly relevant. 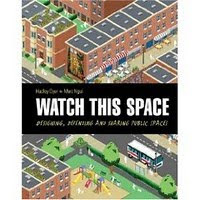 However, if you have an active teen advisory group and are thinking of renovating or designing a teen space - or a new library space - I'd recommend using this in discussion to involve teens in designing their own public space.